The recently concluded Budget Session of the Parliament was amongst the most productive in recent times. During this session, Lok Sabha worked for 123% of its scheduled time, while Rajya Sabha’s productivity was at 101%. Though both Houses of Parliament witnessed disruptions on issues of farmer suicides, food parks, and a CAG audit report on renewable energy financing, the House could transact significant legislative business. The Budget session of Parliament began on February 23, 2015 and broke for a 3-week recess on March 20, 2015. In this session, Bills replacing Ordinances constituted 39% of the total Bills introduced. In the last 10 years, the other instance when Ordinances had a high share of the Bills introduced was in Budget session 2008 when the Ordinance to Total Bills introduced ratio was 42%. Bills replacing Ordinances this session addressed insurance, coal, mines, mines and minerals, citizenship, Andhra Pradesh reorganisation and land acquisition. Of these Bills five were passed and the Land Acquisition Bill (Ordinance promulgated twice) was referred to a Joint Parliamentary Committee. In a rare instance- the first time in 47 years, a private member's Bill, The Rights of Transgender Persons Bill, 2014 protecting and providing rights for transgenders was passed by the Rajya Sabha. After many years, an amendment to the motion of thanks to the President's address (moved by Mr. Sitaram Yechury and fellow CPI(M) member P. Rajeeve) was passed in the Rajya Sabha. The Companies (Amendment) Bill 2014 was introduced in the Lok Sabha on December 12, 2014 by the Minister of Finance, Mr. Arun Jaitley. It was passed in Lok Sabha on December 17, 2014, and in the Rajya Sabha on May 13, 2015. The Bill introduces certain amendments in relation to Related Party Transactions, fraud reporting by auditors, making common seal optional, and jurisdiction of special courts to try certain offences etc. The Statement of Objects and Reasons of the Bill states that this is to ensure ease of business. The Bill removes the requirement of a minimum paid up share capital amount for private and public companies. It also provides for stringent punishment for contraventions for acceptance of deposits by the company from the public. Under the Act, any contract of a particular sum that a company wants to enter into must have prior approval of the company by a special resolution. The Bill replaces the requirement of obtaining a special resolution with that of an ordinary resolution. The Bill also states that a resolution would not be necessary for transactions between a holding company and its wholly owned subsidiary whose accounts are consolidated with such holding company and have been placed before the shareholders for their approval. The Bill also deletes the requirement of a common seal for the company throughout the Act. The Undisclosed Foreign Income and Assets (Imposition of Tax) Bill, 2015 was introduced in Lok Sabha on March 20, 2015 by the Minister of Finance, Mr. Arun Jaitley. It was passed in the Rajya Sabha on May 13, 2015. The Bill will apply to Indian residents and seeks to replace the Income Tax (IT) Act, 1961 for the taxation of foreign income. It penalizes the concealment of foreign income, and provides for criminal liability for attempting to evade tax in relation to foreign income. A flat rate of 30 per cent tax would apply to undisclosed foreign income or assets of the previous assessment year. No exemption, deduction or set off of any carried forward losses (as provided under the IT Act) would apply. This would apply from April 1, 2016 onwards. The penalty for nondisclosure of foreign income or assets would be equal to three times the amount of tax payable, in addition to tax payable at 30%. The penalty for not furnishing income tax returns in relation to foreign income or assets is a fine of Rs 10 lakh. This would not apply to an asset, with a value of five lakh rupees or less. If a person who has filed tax returns does not disclose his foreign income, or submits inaccurate details of the same, he has to pay a fine of Rs 10 lakh. This would not apply to an asset, with a value of five lakh rupees or less. The Constitution (119th Amendment) Bill, 2013 was introduced in the Rajya Sabha on December 18, 2013 by Mr. Salman Khurshid, Minister of External Affairs. It was referred to the Parliamentary Standing Committee on Law and Justice in 2013. The Committee submitted its report on December 1, 2014. The Bill was passed in the Rajya Sabha on May 6, 2015 and in the Lok Sabha on May 7, 2015. The Bill amends the First Schedule of the Constitution to give effect to an agreement entered into by India and Bangladesh on the acquiring and transfer of territories between the two countries on May 16, 1974. The said India-Bangladesh Agreement was signed in 1974, but was not ratified as it involved transfer of territory which required a Constitutional Amendment. Hence, the Bill was introduced. The Bill refers to demarcated land boundaries in accordance with the India-Bangladesh agreement signed on May 16, 1974. This agreement underwent further modification through letters exchanged thereafter and a protocol on September 6, 2011. The territories involved are in the states of Assam, West Bengal, Meghalaya and Tripura. Many of these are enclaves (i.e., territory belonging to one country that is entirely surrounded by the other country), and there are even enclaves-within-enclaves. The Public Premises (Eviction of Unauthorised Occupants) Amendment Bill, 2014 was introduced in the Lok Sabha by the Minister of Urban Development, Mr. Venkaiah Naidu, on December 11, 2014. The Bill was passed by Lok Sabha on December 15, 2014, and by the Rajya Sabha on February 24, 2015. The Bill seeks to amend the Public Premises (Eviction of Unauthorised Occupants) Act, 1971. The Act provides for the speedy eviction of unauthorised occupants from public premises, including those of government companies and corporations. The Act includes certain premises as public premises, to which its provisions extend. For example, it includes premises belonging to or leased by companies in which the central government owns at least 51% shares (including subsidiaries of these companies), premises belonging universities established under a central Act, etc. The Act outlines the process that must be followed by Estate Officers in determining whether the premises are in unauthorised occupation. The Bill outlines time limits for certain actions to be followed while evicting unauthorised occupants. The Citizenship (Amendment) Bill, 2015 was introduced in Lok Sabha by the Minister of State, Ministry of Home Affairs, Mr. Haribhai Partibhai Chaudhary on February 27, 2015. It was passed by the Lok Sabha on March 2, 2015 and by the Rajya Sabha on March 4, 2015. The Bill amends the Citizenship Act, 1955. The Act allows a person to apply for citizenship by registration or naturalisation if they fulfil certain qualifications. The Bill allows the central government to relax the requirement of 12 months stay or service if special circumstances exist. Relaxation up to 30 days may be permitted. The Act outlines certain qualifications for registering a person as an Overseas Citizen of India. The Bill provides certain additional grounds for registering for an Overseas Citizen of India card. The Act also provides that any person who is/has been a citizen of Pakistan or Bangladesh or any other country which is notified by the central government will be ineligible to apply for Overseas Citizenship of India. The Bill extends this provision to cover persons whose parents/grandparents/ great-grandparents were citizens of any of the above countries. 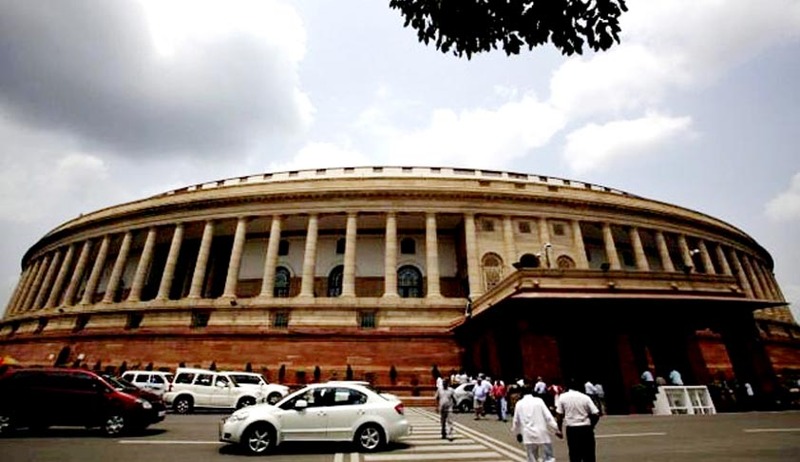 The Andhra Pradesh Reorganisation (Amendment) Bill, 2015 was introduced in Lok Sabha by the Minister of Home Affairs, Mr. Rajnath Singh, on March 2, 2015. The Bill seeks to amend the Andhra Pradesh Reorganisation Act, 2014. It was passed by the Lok Sabha on March 17, 2015 and by the Rajya Sabha on March 20, 2015. The Andhra Pradesh Reorganisation Act, 2014 provides for bifurcation of Andhra Pradesh into the successor states of Andhra Pradesh and Telangana. Among other things, it addresses the representation of the states in Parliament, separate Legislative Assemblies and Legislative Councils for both states etc. The Bill seeks to increase the members elected by members of the state Legislative Assembly from 17 to 20. The Insurance Laws (Amendment) Bill, 2015 was passed by the Lok Sabha on March 4, 2015 and by the Rajya Sabha on March 12, 2015. The Bill provides for enhancement of the foreign direct investment cap in an Indian Insurance Company from 26% to a composite limit of 49%. The Bill enables foreign reinsurers to set up branches in India and defines ‘re-insurance’ to mean “the insurance of part of one insurer’s risk by another insurer who accepts the risk for a mutually acceptable premium”, and thereby excludes the possibility of 100% ceding of risk to a re-insurer, which could lead to companies acting as front companies for other insurers. Apart from these Bills which were passed by both Houses of Parliament, certain other significant Bills were passed by either of the two Houses of parliament and are expected to be passed by the other House in the upcoming Monsoon session. Cases of dishonour of cheques can be filed only in a court in whose jurisdiction the bank branch of the payee (person in whose favour the cheque has been issued) is situated. If a complaint against a person issuing a cheque has been filed in the court with the appropriate jurisdiction, then all subsequent complaints against that person will be filed in the same court, irrespective of the relevant jurisdiction area. If more than one case is filed against the same person before different courts, the cases will be transferred to the court with the appropriate jurisdiction. The Bill also seeks to amend the definition of cheque in the electronic form. While the Act defines it as a cheque containing the exact mirror image of a paper cheque and generated in a secure system using a digital signature, the amendment Bill seeks to define it as a cheque drawn in electronic medium using any computer resource and which is signed in a secure system with a digital signature, or electronic system. The Bill permits juveniles between the ages of 16-18 years to be tried as adults for heinous offences. Also, any 16-18 year old, who commits a lesser, i.e., serious offence, may be tried as an adult only if he is apprehended after the age of 21 years. Juvenile Justice Boards (JJB) and Child Welfare Committees (CWC) will be constituted in each district. The JJB will conduct a preliminary inquiry to determine whether a juvenile offender is to be sent for rehabilitation or be tried as an adult. The CWC will determine institutional care for children in need of care and protection. Eligibility of adoptive parents and the procedure for adoption have been included in the Bill. The Constitution (One Hundred and Twenty-Second Amendment) Bill, 2014 was introduced in the Lok Sabha on December 19, 2014 by the Minister of Finance, Mr. Arun Jaitley and passed by the House on May 6, 2015. The Bill seeks to amend the Constitution to introduce the goods and services tax (GST). Consequently, the GST subsumes various central indirect taxes including the Central Excise Duty, Countervailing Duty, Service Tax, etc. It also subsumes state value added tax, octroi and entry tax, luxury tax, etc. The Bill inserts a new Article in the Constitution to give the central and state governments the concurrent power to make laws on the taxation of goods and services. However, only the centre may levy and collect GST on supplies in the course of inter-state trade or commerce. The tax collected would be divided between the centre and the states in a manner to be provided by Parliament, by law, on the recommendations of the GST Council. The President must constitute a Goods and Services Tax Council within sixty days of this Act coming into force. The GST Council aim to develop a harmonized national market of goods and services. The GST Council is to consist of the following three members: (i) the Union Finance Minister (as Chairman), (ii) the Union Minister of State in charge of Revenue or Finance, and (iii) the Minister in charge of Finance or Taxation or any other, nominated by each state government.